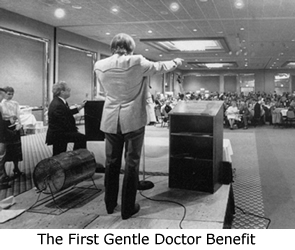 The Gentle Doctor Benefit as we know it today actually evolved out of a huge garage sale. 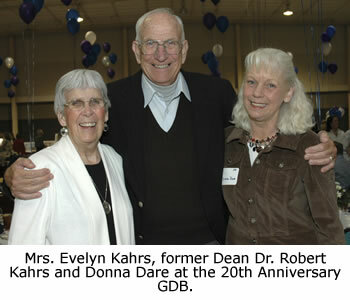 It began with an idea conceived by Mrs. Evelyn Kahrs (wife of Dr. Robert Kahrs, CVM dean at the time) and Dr. Ken Niemeyer (then the associate dean for Academic and Student Affairs). Although that garage sale raised about $3,200, it was a tremendous amount of work. As a result, Mrs. Kahrs and Dr. Niemeyer decided to go in a different direction. The following year, a luncheon and auction were held at Stephens College as part of the newly formed Parents’ Day. It was a small event, but when the first baseball cap auctioned raised $100, the potential for something great was apparent! After this luncheon, Jack Drake, father of Michelle Drake, DVM, Class of 1989, came forward. He had a wealth of experience with parochial school auctions in St. Louis and also saw potential for the auction. He wanted to get parents involved to create a large-scale fundraiser that would coincide with Parents’ Day. Mr. Drake, Mrs. Kahrs, and Dr. Niemeyer put together a parents’ committee. In the Dean’s Office, Ben Riley and Donna Dare took care of the details of the fundraiser.